Corn dogs are amazing. That’s all that really needs to be said about them. Except that I want to add that homemade corn dogs are even better than amazing. I’m still adjusting this recipe a little bit for the batter. The corn meal is a little too gritty for my tastes so I’m testing doing a combo of corn flour and corn meal. So far the tests haven’t resulted in a satisfactory adjustment, but here’s the base recipe to get you started. If I do ever find the secret, I’ll post an update. If you have a suggestion, leave it in the comments! Heat 3 inches of oil in a heavy pot to 375 deg F.
Meanwhile, in a medium sized bowl, mix the cornmeal, biscuit mix, and sugar. Beat in the egg and milk. The batter should have the consistency of thick pancake batter. If you need to, add more biscuit mix to thicken. To make corn dogs, put hot dogs on sticks or cut into bite sized pieces. 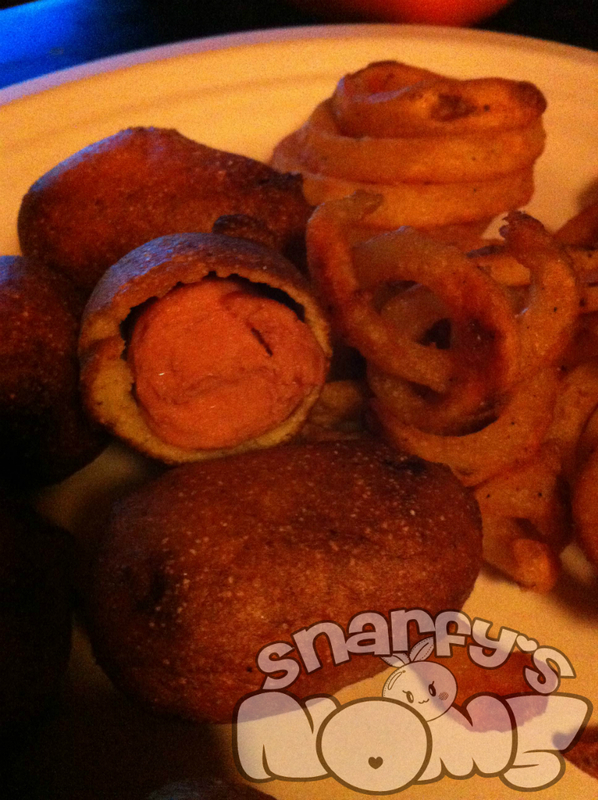 Roll hot dogs in batter until covered and drop in the hot oil for 3-5 minutes or until golden brown on all sides. Drain on a paper towel lined plate. The recipe makes enough batter for one package of hot dogs.